OS X Mavericks has a lot of new features you can interact with and see. But Apple also took the time to implement several changes to the core of the operating system that help the system run better overall. These under-the-hood changes boost performance and battery life. Improvements to Haswell, Intel’s fourth generation of Core processors, which are now showing up in Macs, focus primarily on boosting efficiency and reducing power consumption. Mavericks also has some tricks up its sleeve that Apple claims will let Mac users get even more work done on a single battery charge. 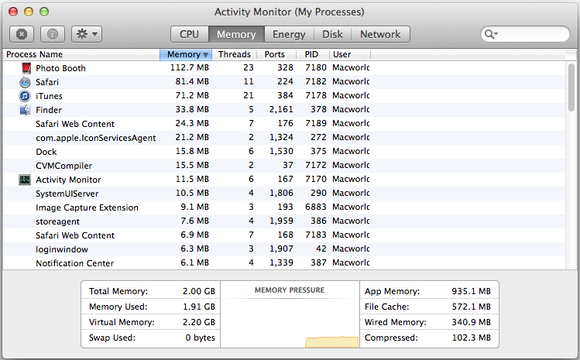 Running processors drain battery life, so Mavericks tries to put the CPU into an idle state whenever possible. Powering the processor back up to a ready state also requires a significant amount of energy, so it’s important to extend that power-sipping idle time long enough to provide a real reduction in energy use. The problem is that most applications aren’t aware that the processor is taking a break, and they continually pester the processor to wake up and take care of small housekeeping chores in the background. These background processes may be necessary, but the various apps don’t coordinate the timing of their calls, which means the processor frequently has to power back up to handle these small tasks. Timer Coalescing, a feature new to the Mac OS but used by Microsoft since Windows 7, aims to extend processor idle time by adjusting the timing of application calls to bundle several tasks together and run them all at once instead of one at a time. The result is that the CPU makes better use of its time while at work, it has longer idle times, it spends less time waking up, and you enjoy better battery life. Solid-state drives may be fast, but your Mac’s RAM is much faster. That’s why applications try to load all their necessary data to the Mac’s memory for quick and easy access to the bits and bytes they need most. But what happens when your Mac runs out of space in memory? When RAM space runs low, OS X Mavericks swaps data the Mac isn’t currently using to virtual memory—a portion of your main storage drive reserved for this purpose—and moves the newly requested data into its place in RAM. The new Activity Monitor displays more-detailed information about your memory usage. This data-swapping takes time, especially if the virtual memory resides on a hard drive, and can result in sluggish application performance. While adding RAM is an option for some Mac users, it can be costly—and on some Macs, you can’t upgrade the RAM. In Mavericks, Apple introduces Memory Compression, which is based on the concept that it’s faster to compress and uncompress data residing in RAM than to transfer the data from memory to your drive and back. Under Mavericks, when applications try to load more data into RAM than your Mac has capacity for, the operating system compacts the least-used bits of data, so the data takes up half the room it did previously. If you need that data again, Mavericks can quickly uncompress it and make it available to the requesting application. Activity Monitor lets you see this feature in action. Under the Memory tab, a new statistic shows you just how much data is currently compressed. Not only should Memory Compression improve performance in memory-hungry applications, but, since it reduces how often your Mac needs to access storage devices, it should also curb wear and tear on hard drives and SSDs. It’s really annoying when you visit a website and you’re bombarded with video that plays automatically or animations that make the site load slowly. You may not realize that all this activity draws upon your Mac’s hardware resources; on a laptop, that means it’s draining the battery. Since Web browsing is a huge part of daily computer use, such websites can have a drastic affect on how long your battery’s charge lasts. If Safari spots an autoplaying video, it pauses that video and shows only the first frame to preserve your battery life. What can you do about it? Apple took matters into its own hands in Safari 7, which comes with OS X Mavericks. It has tweaked Safari 7 to help save battery life. The major change under the hood is Safari Power Saver, which, according to Apple, can reduce power usage when you’re Web browsing by up to 35 percent. You’ve probably noticed that irritating autoplay videos aren’t always the main content on a webpage—they’re often on the margins, in a small window. Safari Power Saver will prevent those side videos from playing automatically, showing one of the first frames of the video instead. If you want to watch the video, all you need to do is click it. 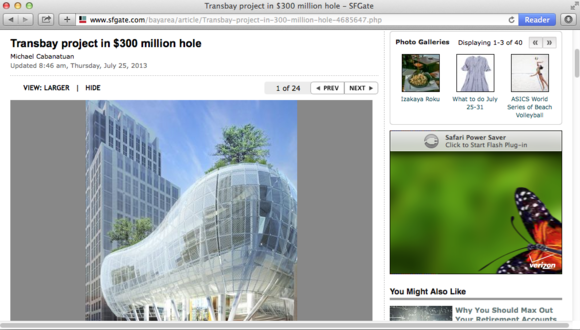 The feature is functionally similar to what ClickToFlash provides for Safari 6. Safari Power Saver won’t prevent the main video on a page from playing, so you can concentrate on the content you intend to consume. Safari 7 has another power-saving feature that’s similar to App Nap. Only the tab you’re currently using runs at 100 percent; any other tabs stay in an inactive mode. If you switch to another tab, that tab becomes active at full speed, and Safari deactivates the tab you switched from.